The fiber laser market is expected to grow from US$ 2.2 billion in 2017 to US$ 4.4 billion in 2025. 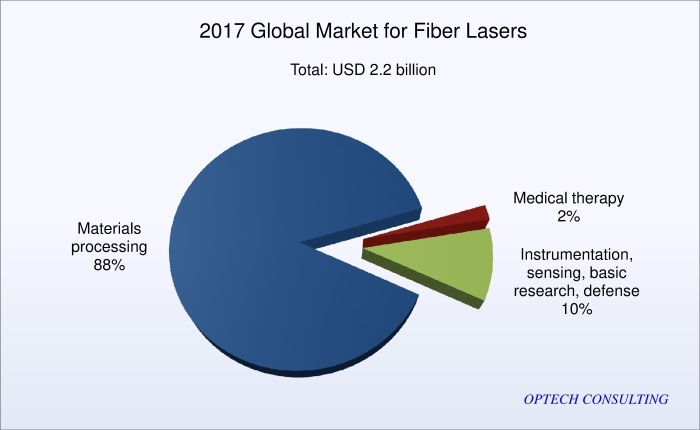 Fiber lasers hold a market share of 33% in the addressable application areas, including materials processing, instrumentation, measurement and sensing, medical therapy, large area video projection, defense, and basic research. 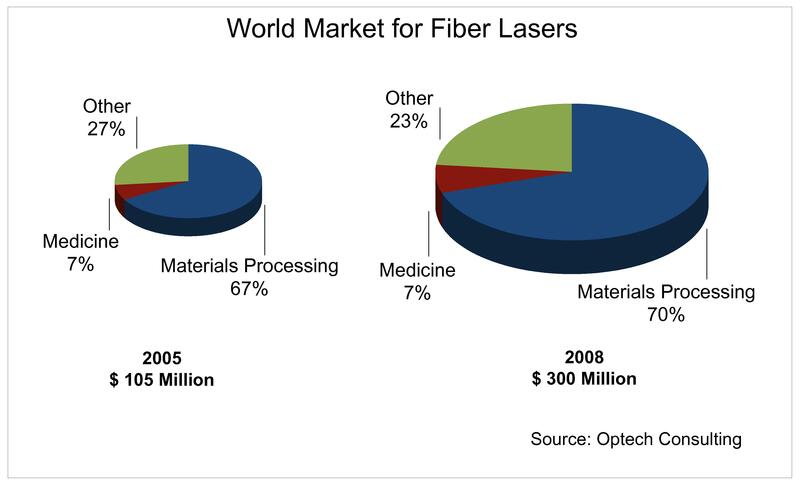 Especially in materials processing, which is by far the most important field of application of fiber lasers, their market share has increased steeply, from 4% in 2005 to 12% in 2010, 36% in 2016, and 43% in 2017. The rapid success of fiber lasers until now was due to the replacement of other lasers in existing applications such as cutting, welding and marking. Fiber lasers offer advantages regarding power consumption, compactness, and ruggedness, while providing the power, pulse parameters, beam quality, and wavelengths needed by major applications. Moreover, due to lower cost and easy integrability, fiber lasers have extended the application range of conventional lasers especially in cutting and marking. 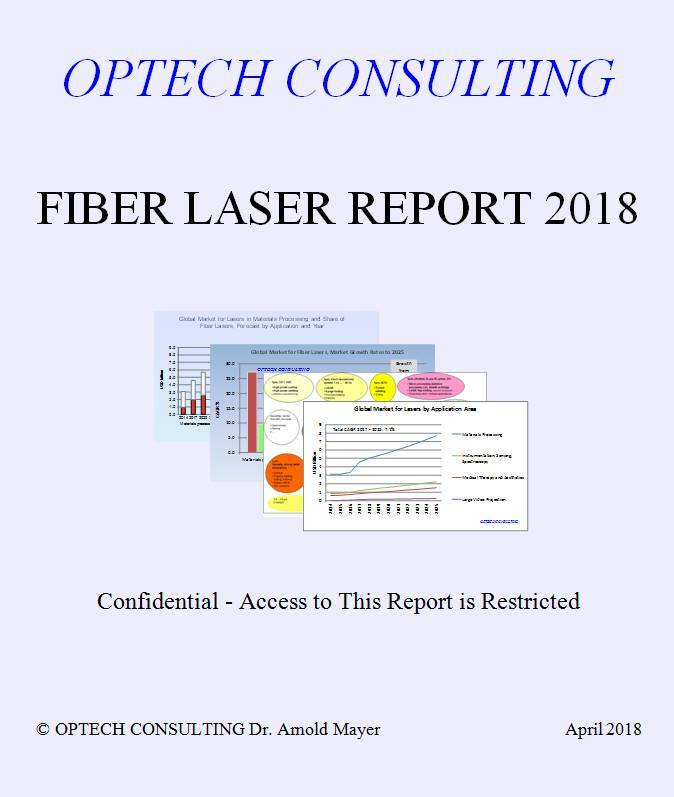 In 2017, the major source of growth for the fiber laser market was for the first time not substitution of other lasers but market expansion, in new applications as well as in existing applications due decreased laser prices at the low end (mass market) as well as due to increased performance at the high end (power, pulse parameters). In addition, the booming demand for industrial lasers in China fueled the market increase in spite of the narrowing substitution potential. During the last ten years the majority of startup companies in the field of laser sources focused on fiber lasers. Today, about 100 companies sell and many more companies develop fiber lasers. Especially in China many companies have developed fiber lasers for the major market segments including high power cw and nanosecond pulsed fiber lasers. 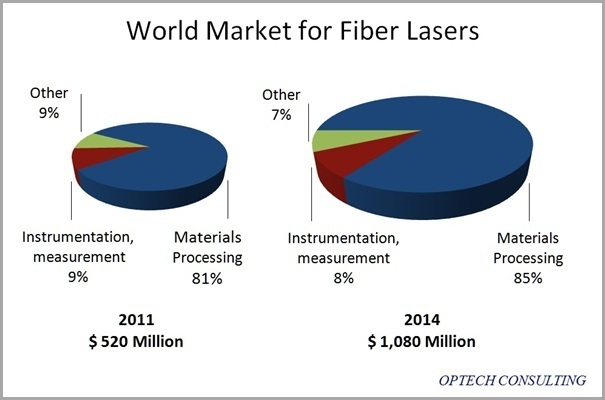 The major markets for fiber lasers are Europe and China. These regions are the major end markets for manufacturing systems equipped with fiber lasers, and the two regions are also the home of the majority of the major system integrators.